Arulmigu Adhiparasakthi Siddhar Peetam pkis situated at Melmaruvathur, 92 km from Chennai (Formerly known as Madras) in the southern state of Tamil Nadu, India. Tamil is the place where 21 Siddhars (saints) men as well as women from different religion, had their Jeeva-Samadhis (meaning, where the Siddhars left their human forms behind, while they are still alive as holy spirits). 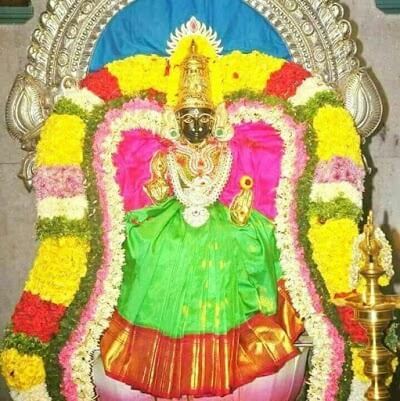 Here in Melmaruvathur Adiparashakti Siddhar Peetam, the divine mother Adhi para sakthi transmigrates into Arulthiru Bangaru Adigalar thereby promoting spirituality and devotion. Where the current temple’s sanctum sanctorum stands today, there was only a neem tree in the 1960s. Unlike every other neem tree, which bear bitter tasting fruit, this tree secreted and dripped a sweet nectar. Residents of that village found that they had an urge in their mind to taste this nectar whenever they passed by this tree. Since many passers reported of curing their illness and diseases after tasting this nectar, the word spread swiftly to entire village and its neighborhood. So it became a customary for these villagers to take a drop of this nectar to ailing friends and relatives. They treated this as a medicinal tree and protected it from grazing cattle and wood cutters. In 1966, a severe storm uprooted this neem tree, which exposed the Swayambu underneath to the villagers for the first time. Swayambu means A self emerging, naturally formed oval shaped object (carved of rock). People built a small hut on top of this Swayambu and conducted poojas (prayer rituals) to it. This place is known as Siddhar Peetam (Siddhar in Tamil language means enlightened or evolved souls. Peetam means throne. Thus Siddhar Peetam means The Throne of Evolved Souls or Great Spiritual Masters/Gurus) where 21 Siddhars are laid in Jeeva Samaadhi. Swayambu alone was worshipped for many years. The idol of Mother Adhi para sakthi was installed later in the sanctum sanctorum on November 25, 1977. The idol of beautiful Mother is three feet tall, seated on thousand-petal lotus seat, with her right leg folded and the left leg resting on the lotus petals. The thousand petal lotus has significance in meditation. In this idol form, She holds the bud of a lotus in her right hand, the mudhra (sign) of knowledge in her left hand and with her hair plait and knotted upwards like a crown. The basic tenet of Melmaruvathur Adhiparasakthi Siddhar Peetam is One Mother, One Humanity, means the whole human race is one and all the human beings who inhabit this vast earth are children of Mother Goddess. Amma has revolutionized the concept of spirituality and to enter the sanctum sanctorum and perform the daily rituals and prayers to the Mother AdhiParaSakthi. The main objective for which the Siddhar Peetam strives is the cult of Sakthi that is, the whole humanity is born of one omnipotent Mother and hence the whole humanity is one, should be upheld, and each an everyone’s grievances should be removed. Here in Melmaruvathur Adhiparasakthi Siddhar Peetam, during the transmigration Adigalar (AMMA) tells Arulvakku (oracle). 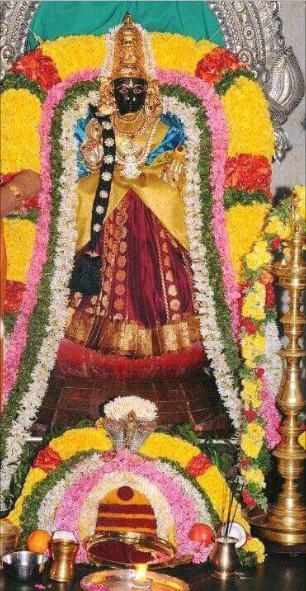 Through the Arulvakku (oracle) Adhi parasakthi herself speaks to her devotees, this is the unique specialty of this Siddhar Peetam. Hearing the Goddess Adhiparasakthi’s oracle is a great spiritual experience, this miracle takes place at Siddhar peetam. 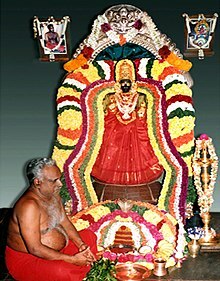 Arul Thiru Bangaru Adigalar is called by his devotees as AMMA (means Mother), here in Siddhar Peetam whatever “AMMA” says is the law and it is administered under the guidance of ‘AMMA’ which is a divine administration. InMelmaruvathur, women are permitted to perform poojas in the sanctum sanctorum. The Mother in order to keep blessing people at all times, dwells in the snake pit (putrumandapam) in the form of a cobra. The Mother appears before the devotees who stay in the mandapam (Hall) at nights, in the form of a snake till this day. It is the putrumandapam where the Mother gives her Oracle. Saptha Kanniyar Kovil (The Temple of Seven Virgins) to the right of putrumandapam. Normally the temple of the virgins will never have a roof. So also this temple of the virgins, with wall on four sides has no roof. 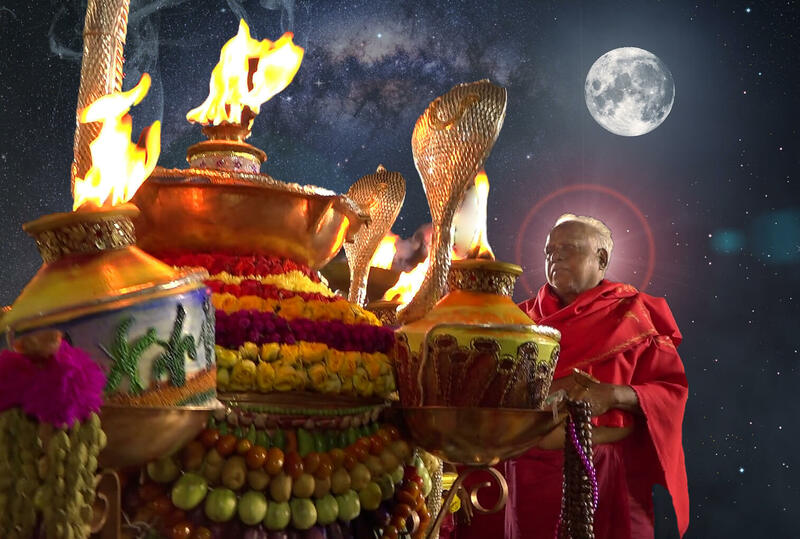 To ascertain the fact that all are her children and that She doesn’t differentiate between any of us, the Mother ordained the local Harijans (considered to be low caste people in India) to construct the Saptha Kanniyar (Saptha means seven and Kanni means virgin. Kanniyar is plural for virgins) worship center within the Temple. 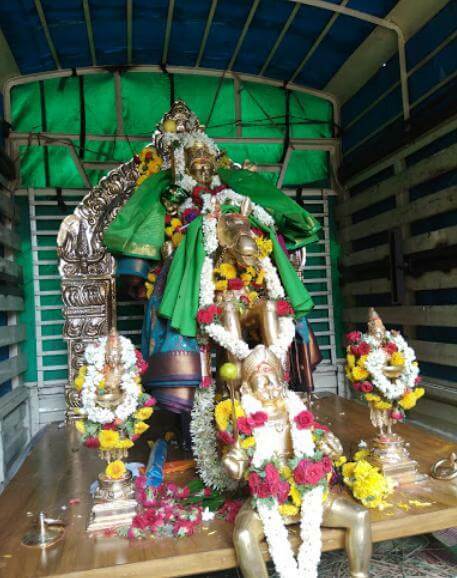 In 1974, the Saptha (Seven) Kanni (Virgin Angels) Sannidhi (Temple) was consecrated in Melmaruvathur Adhiparasakthi Siddhar Peetam, Tamil Nadu, India. As with everything else in Melmaruvathur, Saptha Kanniyar (Virgin Mothers) and their Temple is also unique, transcends the traditional and emphasizes the fundamental Universal Nature of these Mothers. Seven Angels are Saptha Matre, Saptha Matrikas, Saptha Kannikas, etc. Also, some of these sources attempt to differentiate between Matrikas, Matre and Virgin Angels, although in reality, they are one and the same. In all Hindu scripts and Devi Mahatmyam, one will note that Saptha Kannikas are mentioned as Parivaara Devataas of Aadhi paraa shakti. Among the millions of Parivaara Devataas, these Seven Virgin Mothers carry special place in Aadhi para shakti as depicted in Sri Yantra (Sri Chakra). The seven nodes in the middle line of the First Enclosure (Prathama Aavaranaa) are occupied by the Saptha Kannikas, namely Brahmi, Mahe’shwari, Kowmaari, Vaishnavi, Vaaraahi, Indraani, and Chaamundi . The eighth node is occupied by Mahalakshmi. Traditionally, all the Hindu Temples in villages and rural areas of India, these seven virgin mothers are consecrated as seven stones and worshipped as formless. These shrines are often called “Kanni Kovil” meaning “Virgin Temples”.